Yes, it really does hover! Now here is a perfect gift idea for that space junkie friend of yours. Space Wave Flying UFO is not only cool but also unique. And it doesn’t need batteries or remote control or electrical chargers. Just the palm of your hand is enough to spin some space magic. With just a whizz your Space Wave Flying UFO will be hovering on top of your hand or leg imitating your movement almost like magic. Now here is a perfect gift idea for that space junkie friend of yours. Space Wave Flying UFO is not only cool but also unique. And it doesn’t need batteries or remote control or electrical chargers. Just the palm of your hand is enough to spin some space magic. With just a whizz your Space Wave Flying UFO will be hovering on top of your hand or leg imitating your movement almost like magic. With altitude sensing technology, this cool UFO hovers mid-air above your hand whizzing around as you move your hand. If you have friends who are anti-UFO here is a chance to bamboozle them with just a flick of your palm. 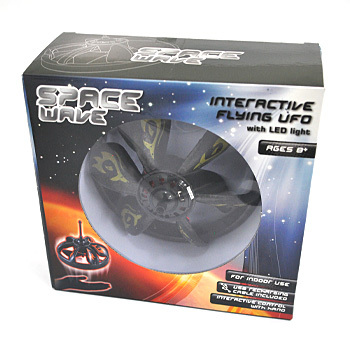 A perfect gift for any UFO fan, buy this flying UFO for your favourite nephew or niece, they will love it! It also makes a great gift idea for anyone who loves science fiction gizmos. Product dimensions (when boxed): 25 cm (H) x 15 cm (W) x 18 cm (D) / 9.8 (H) x 5.9 (W) x 7.1 (D) inches.